Rate this project Paul Sherman has announced the availability of the initial beta build of Absolute Linux 15.0, a major update of the project's Slackware-based distribution featuring the IceWM window manager. This version drops support for the x86 processors and introduces the Kodi media player application: "Absolute 15.0 beta 1 released, based on Slackware64-current. Releasing as beta, giving the opportunity to get extra testing and feedback prior to final. Also to help mitigate the current Meltdown and Spectre security problems, of which the current Slackware kernel (4.14.12) takes care of 2 out of 3 vulnerabilities. Other changes: PaleMoon is the default browser, but is Firefox also installed (if PaleMoons default page search gives you problems, just go to the search page you want, then drag and drop the page icon onto the homepage button); Python 3 (and wxpython/GTK+ 3) and Qt 5 are included, as well as Python 2.7 and Qt 4; includes Kodi home theater 17.6; most everything recompiled." Here is the brief release announcement. Download (MD5) the installation DVD images from SourceForge: absolute64-15.0b1.iso (1,960MB, pkglist). Paul Sherman has announced the release of Absolute Linux 14.2, a new version of the project's Slackware-based distribution featuring the lightweight IceWM window manager as the default desktop user interface: "Absolute Linux 14.2 released, based on Slackware 14.2. It comes in a 32-bit and a 64-bit variants. Same basic functionality, but most everything updated under the hood. No longer fits on a single CD - the usual installation method is a USB stick. With this size-constraint removed, larger applications like LibreOffice and Calibre are now included in the base installation. Both installers have an 'Autoinstall' option, which partitions and formats your drive. The 64-bit edition will make GPT partitions if you are booting EFI. But just as with Slackware, you need to turn off Secure Boot in the BIOS if it is set. The applications and development libraries are more extensive than previous releases." Visit the distribution's home page to read the full release announcement and see also the changelog for minute details. Download (MD5) the (text-mode) installation DVD images from here: absolute64-14.2.iso (1,198MB, pkglist), absolute-14.2.iso (967MB). 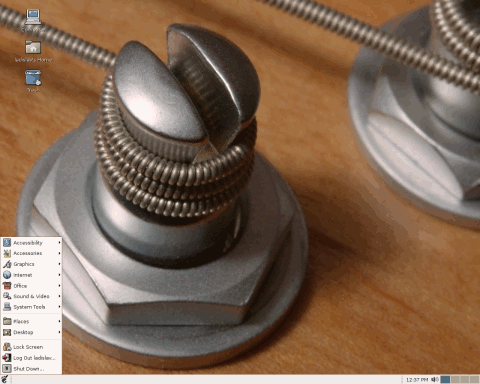 Paul Sherman has announced the release of Absolute Linux 14.12. Absolute Linux is a Slackware-based distribution featuring the lightweight IceWM window manager as the default desktop. This release is based on Slackware's latest development tree: "Absolute 14.12 released. This release is based upon Slackware Current (prior to 14.2 release). Many of the same applications and features, but recompiled nearly everything due to newer libraries (especially the PNG libraries). Python 3, and GTK+ 3 transitions have begun, I suppose, as both are now available. Extra support packages will be needed by applications that do use them." This version is built on top of Linux kernel 4.1.6. Some other notable updates in the changelog include: "AbiWord 3.0.1, MESA 11.0.0, glibc 2.22, IceWM 1.3.7.2, PulseAudio 6.0, GCC 4.9.3...." Visit the distribution's home page to read the brief release announcement. Download (MD5) the installation CD or the larger DVD image (which includes LibreOffice 5.0.1, Calibre, development tools and extra applications) from here: absolute-14.12.iso (699MB), absolute-14.12_large.iso (1,178MB, pkglist). Paul Sherman has announced the release of Absolute Linux 14.10, a new version of the project's lightweight desktop distribution based on Slackware Linux 14.1 (with updates from Slackware's "Current" tree) and featuring the IceWM window manager: "Absolute 14.10 released. This is a 'first' release based upon Slackware Linux 14.1 It has been a long road back, but here it is. Everythibng has caught up to Slackware (x86), up to and including a recompile with patch for the latest glibc security patch of 20140826. Even have PulseAudio working to keep the Skypers happy. The base install still fits easily onto a CD. If you want to burn a DVD or, more likely, plop the ISO image onto a USB stick, there is also a 'large' version of the ISO image, which includes LibreOffice, the kernel source, Calibre, Inkscape, Skype, Artha dictionary and thesaurus and several developer tools." Visit the distribution's home page to read the brief release announcement. Download (MD5) the installation CD or DVD image from here: absolute-14.10.iso (681MB), absolute-14.10_large.iso (987MB, pkglist). Paul Sherman has announced the release of Absolute Linux 14.0, a major new version of the project's lightweight desktop distribution based on Slackware Linux and featuring the IceWM window manager: "Absolute Linux 14.0 released. Coincides with the Slackware 14.0 release, keeping in step with libraries, toolchain and basic applications. Absolute has moved away from udisks to use the lighter SpaceFM file manager, which takes advantage of native kernel polling. So as always, Absolute will run fast on modest hardware. NetworkManager is taking care of Internet connections by default. Java and multimedia add-ons need to be installed (via system tools, as root) post-installation. Chrome browser is now the default (taking the place of chromium and/or Firefox). I distribute the browser with several plugins and the Chrome browser comes with a more up-to-date Flash release than what is available as a generic plugin for Linux machines." Visit the distribution's home page to read the release announcement. 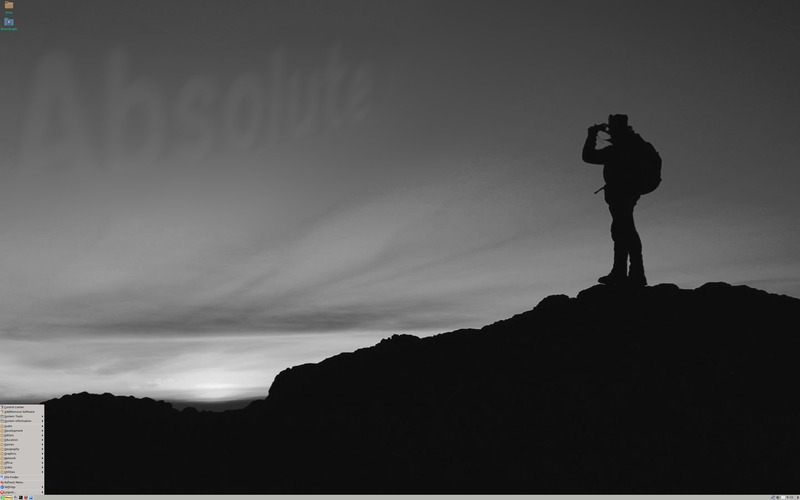 Download (MD5): absolute-14.0.iso (700MB). Paul Sherman has announced the release of Absolute Linux 13.2.2, a lightweight, Slackware-based desktop distribution featuring the IceWM window manager: "Absolute Linux 13.2.2 released. Use of HAL has been dropped for newer ConsoleKit and udisks, as well as LXDE's newer version of PCManFM. Code changes for the Absolute customizations in libfm and PCManFM are included in /usr/doc for each package. Devmon replaces halevt to handle DVD and audio CDs. You'll notice edits to .initrc, .bashrc .bash_logout as well as the start-up file for IceWM reflecting the changes." Other major changes include switch to LibreOffice as the optional office suite, upgrade to IceWM 1.3.7, and synchronisation of packages with Slackware's current tree. See the brief release announcement and the detailed changelog for further information. Download (MD5) the installation CD image from SourceForge: absolute-13.2.2.iso (698MB). The latest version of Absolute Linux, a lightweight Slackware-based distribution with IceWM, comes with Google Chrome as the default web browser and a number of security fixes: "Absolute Linux 13.1.2 released. Google Chrome replaces Mozilla Firefox as default browser. Lower memory usage, faster rendering and proper URL parsing all contributed to this decision. Firefox package is still up to date and in CD2 directory of repos under /internet. Also several security-related updates as well as multimedia installer update (needed updated URL) Also updated rox-archiver to handle DEB files (to unpack, not install). Note that Google Chrome is a native Absolute build with blacklisting of Gecko Media Player plugin removed. This means that the plugin works. It was blacklisted by Google coders due to crashing complaints, but I have tested it extensively and have not experienced these issues, so I'm watching videos." Visit the project's news page to read the brief release announcement. Download (MD5): absolute-13.1.2.iso (691MB). Paul Sherman has announced the release of Absolute Linux 13.1.1, a lightweight Slackware-based distribution with IceWM: "Absolute 13.1.1 released. New kernel and a boatload of updates from Slackware. Almost replaced Firefox with Google Chrome (which I really like) but due to an endless 'upload' bug that keeps crashing Chrome when you try to upload a file, it'll be in the CD2 directory for testing/playing. The 13.1.0 release was a naming snafu as it pre-dated Slackware's update. This release (13.1.1) incorporates Slackware 13.1 as well as several re-compiled packages on Absolute and a couple of scripting changes. Some add-ons in the CD2 directory of the FTP sites (Google Chrome and Picasa for example), gmail-notify added and incorporated into email notification setup as an option. Add/Remove programs (PERL script) updated." There is a brief release announcement on the project's home page and slightly more detailed one in the forum. Download (MD5): absolute-13.1.1.iso (700MB). Paul Sherman has announced the release of Absolute Linux 13.0.8, a lightweight, Slackware-based desktop distribution featuring the IceWM window manager and solid multimedia playback support: "Absolute Linux 13.0.8 released. Multimedia installer fix. Only a few packages changed, but the multimedia installer was not properly updated and this could lead to some confusion and lack of functionality for users who chose to install the media enhancements. Kernel bump - version 2.6.32.7 and all January Slackware updates. Lots of updates to synchronize with Slackware -current and some multimedia scripts updated to keep pace with new kernel device nomenclature. It turned out a lot less painful than expected. Brasero (CD burning) is back, DVDStyler added. Aside from kernel, a lot of multimedia capabilities were updated and tweaked." Visit the project's home page to read the brief release announcement. Download: absolute-13.0.8.iso (689MB, MD5).